One of the products I’ve been consistently using for the past 2 months, twice a week is Juice Beauty’s Green Apple Peel for sensitive skin. Packaged in a simple glass jar with a white lid, nothing fancy or pretentious. Texture of mush baby food and smell is funky (some may call that ‘natural’). I apply with my Wei Mask Brush with a very light hand all over my face. Then I walk away emptying the dishwasher, and loading the washing machine. Theoretically, I should keep it on as per the time limit prescribed on the box. However I’ve always been rebellious and wanna do it my way. So I let it dry until it doesn’t feel sticky on my skin. Extremely important point to note here is Everyone’s degree of skin sensitivity is different. Juice Beauty Claims: This patented organic fruit acid complex with raw cane sugar exfoliates to reduce breakouts, discolorations and fine lines. Heals while hydrating with rejuvenating algae, vitamins and antioxidants for a smooth, glowing complexion. Powerful action without parabens, propylene or butylene glycols, petroluem, sulphates, PEGs, TEA, DEA, phthalates, GMO, silicones, pesticides, artificial dyes or fragrances. What it did for me? It helped me with scarring, pigmentation, congestion under my skin and overall luminosity. Aided better absorption of evening skincare products such as serum and moisturizer. Over a period of time, it has certainly aided thorough exfoliation of skin. If you’ve been reader of this blog you may know my feelings for abrasive exfoliators. Ingredients: Organic Juices Of Pyrus Malus (Apple) Juice (Malic), Citrus Medica Limonum (Lemon) Juice (Citric) & Vitis Vinifera (White Grape) Juice (Tartaric), Organic Saccharum Officinarum (Glycolic Acid), Organic Milk Peptides (Lactic Acid), Organic Aloe Barbadensis Leaf Juice, Glycerin, Hydroxypropyl Starch Phosphate, Sodium Hydroxide, Organic Algae Extract, Sclerotium Gum, Tocopheryl Acetate & Tocopherol (Vitamin E), Ascorbyl Palmitate (Vitamin C), Retinyl Palmitate (Vitamin A), Phospholipids, Magnesium Aspartate, Zinc Gluconate, Copper Gluconate, Phenoxyethanol, Benzyl Alcohol, Potassium Sorbate, Tetrasodium EDTA, Xanthan Gum, Azulene. There are some potential irritants here, which very sensitive skins may not appreciate. I would highly recommend you get a sample before you purchase the full jar and patch test to ensure your skin is ok with this composition. Due to varying degrees of skin sensitivity, this product can be hit and miss. Thankfully a little goes a long way and lasts a while. With 2 months of consistent use, I’ve only used quarter of the jar. Some may find the price a tad steep so there are cheaper alternatives to at home peel products on the market. One such is Andalou Naturals Kombucha Enzyme Exfoliating Peel (review and comparison coming soon). Have you tried any other peels at home? Let me know in the comments below. Happy Friday and Have an Awesome Weekend. Hello all, this product has featured on this blog before but it is SO fabulous that it deserves a post for itself. No sharing the limelight kinda business. The overnight peel is packaged in a very simple white opaque bottle (possibly to keep all acids stable) with a pump and plastic lid. Nothing fancy and nothing that would jump right at you. But hopefully the name of the product ‘Overnight Peel with Alpha Hydroxy Acids’ will catch your attention. Especially if you’re an acid junkie like me (ermmm AHA, BHA acids). Very easily incorporated in nightly routine 2-3 times a week after toning and before moisturizing. Claims: Reveal dramatically fresher, newer skin overnight with this skin-brightening blend of glycolic sugar cane and fruit acids. Our skin-renewing formula contains 5% Alpha Hydroxy Acids (AHA) for safe, effective removal of dead surface skin cells. With every use, skin tone becomes more radiant, pigmentation is evened and age spots are visibly diminished. 100% vegan, cruelty-free, paraben-free, sulfate-free, mineral oil-free, lanolin-free, gluten free, GMO-free. Following morning my skin appears fresh, well rested, even and calm. I’m genetically cursed with pigmentation and puberty cursed acne scars so I need some magical AHA shizz in my life to make it all better. If by a miracle, I’m having happy skin day and it’s all calm, no angry spots I still use as overnight exfoliator and boosting collagen. My skin appears fresher, smoother and supple. Ingredient Listing: Purified Water (Aqua), Glycolic Acid, Caprylic/Capric Triglyceride, Glycerin, Cetearyl Alcohol, Ceteareth 20, Stearic Acid, Lactic Acid, Malic Acid, Citrus Medica Limonum (Lemon) Fruit Extract, Passiflora Incarnata (Passion) Fruit Extract, Ascorbyl Palmitate (C-Ester), Organic Simmondsia Chinensis (Jojoba) Seed Oil* (.1%), Organic Camellia Sinensis (Green Tea) Leaf Extract* (.1%), Glyceryl Stearate and Peg-100 Stearate, Cetyl Alcohol, Xanthan Gum, Dimethicone, Potassium Sorbate, Phenoxyethanol, Ethylhexylglycerin. I’m no qualified chemist so with my countless years of researching each ingredient and being ardent follower of Mrs. Hirons none of these ingredients jump at it negatively. All good acids are the first few ingredients, followed by some fruits, skin moisturizers, and some preservatives. All in all, fab ingredients delivering amazing results. I highly recommend trying this product, especially at the price tag of under $ you can’t go wrong. And thankfully it’s freely available all over the retail stores and online stores. 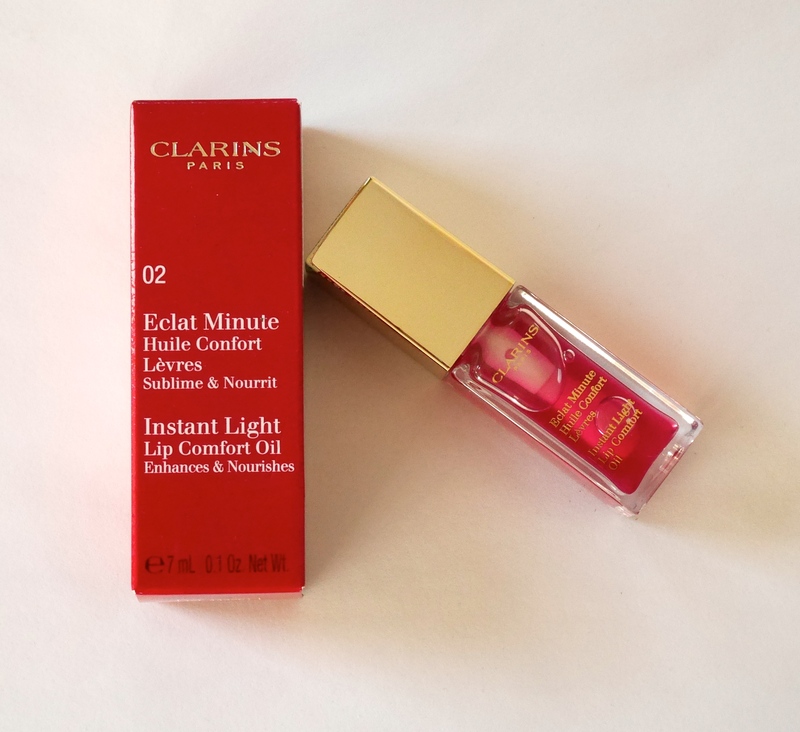 Good Morning Lovelies, so after reading Caroline Hirons rave about Clarins Spring 2015 release I couldn’t wait to get my hands on it. 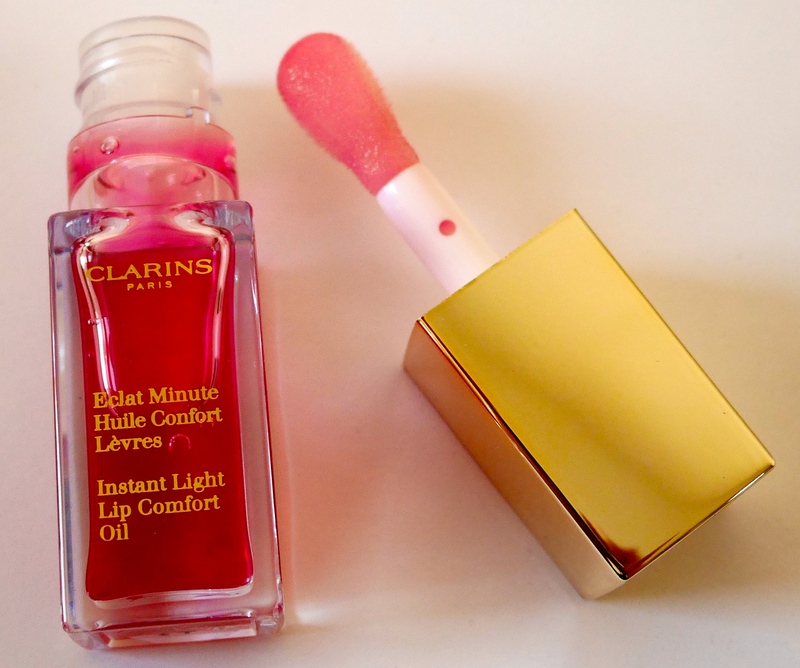 The Instant Light Lip Comfort Oil comes in 2 flavours or shades (whatever) Honey and Raspberry. I was told Raspberry was limited edition and hence I made a very calculated decision to purchase limited edition now and will play with regular line at a later date. I have repeatedly raved about face oils on this blog, and why should lips be left behind in the race. Packaging wise this lip oil is a perfect addition to the hand bag. Tiny, compact and super cute with gold twist top <ticks all boxes for me>. The doe-foot applicator is wide and you just need one stroke across the lip and voila. The scent it very subtle and makes me feel like I’ve eaten raspberries. Very pleasant and not overpowering in the slightest. My lips are pigmented so I cannot really see any colour pay off but I certainly do love the texture of the product. It’s certainly shiny and glossy but not sticky schmicky at all. Some ardent lovers of subtle matt appearing lip moisturizers may not like the idea of glossy lips but I’m certainly all over it. Ingredient wise it appears good enough (based on my limited understanding and Mrs. Hirons seal of approval). 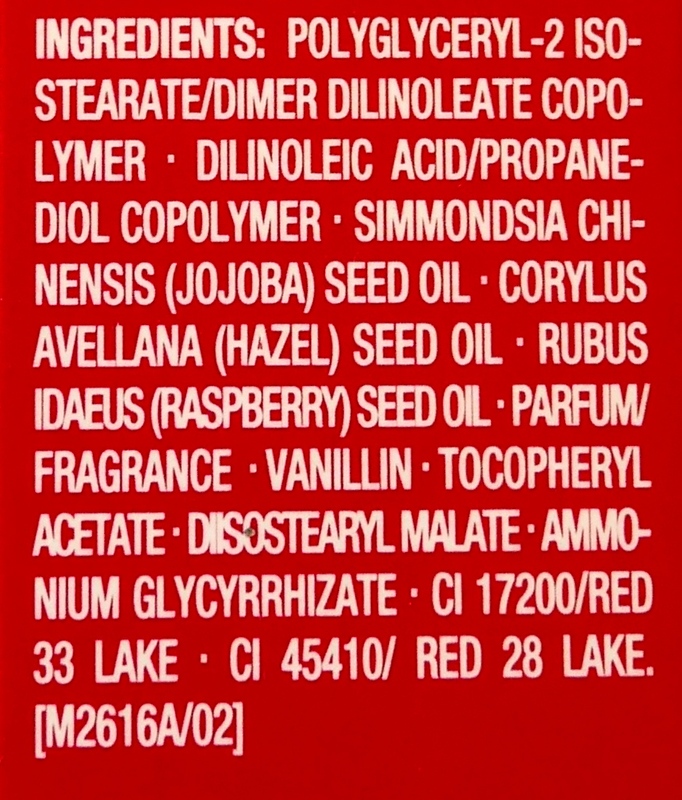 Once I’m through with Raspberry I will get Honey unless Clarins decides to release newer flavours or shades. Good Morning my lovelies. My favorite time of the month came with immense disappoint. My face just dropped, nothing in the box to half excite me. Coastal Scents Eye Shadow Pallete (Latte) – Birchbox you need to read my profile thoroughly, I said no makeup! I’m not huge on eyeshadows, basic winged liner or slightly smoky liner and I’m happy. This has some basic colors which you can’t go wrong with but they aren’t buttery so not the smoothest application. Harvey Prince Sincerely – It sure smells nice but the sillage is nothing to rave about. Number 4 Hair Care Hairspray – I really dislike No 4 Hair products, I don’t fully understand why Birchbox are so obsessed with this brand. Their products are mediocre and don’t always deliver. Plus the nozzle is damaged. Epic fail. Tocca Crema da Mani Cleopatra – A moment here to highlight the fact that I’ve received a sample of this product in the past from Birchbox and they’ve repeated yet again (just different scent)!!! Sure these hand creams smell heavenly but they don’t nourish the skin or doesn’t absorb well. Another Epic fail. 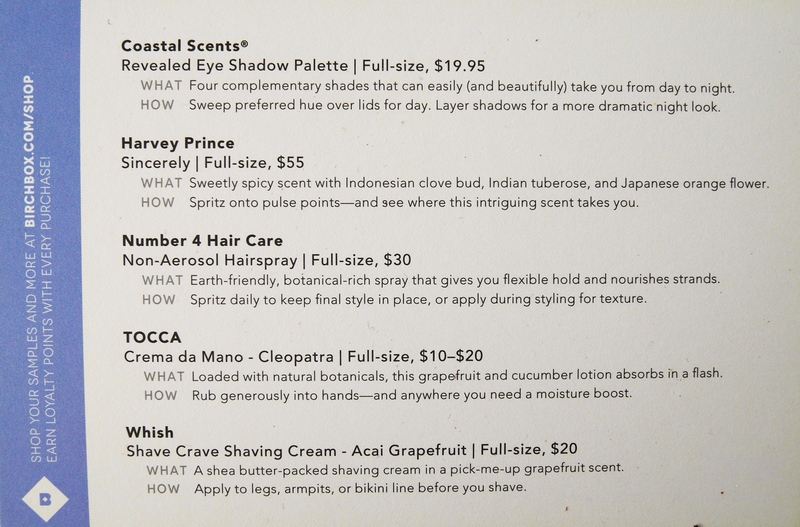 Whish Shave Crave Shaving Cream – I’m yet to try this. 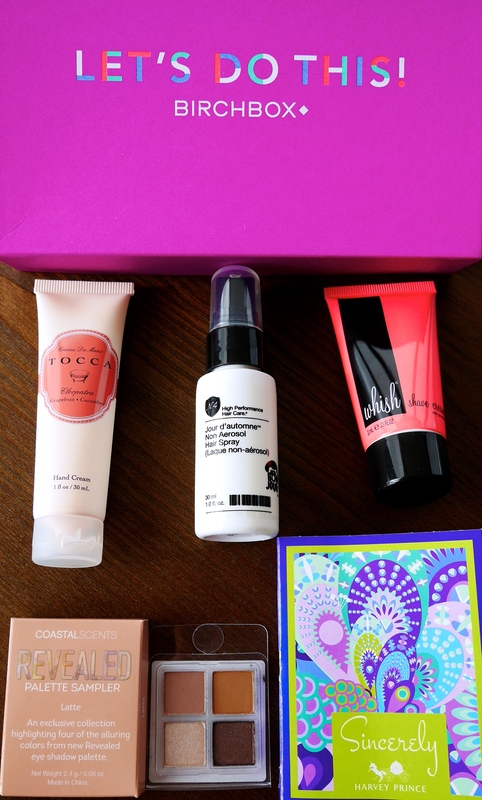 Overall, not a good start to the year Birchbox but I can only hope for a better box next month! Hope and positive thinking is what 2015 is all about. What did you think of your boxes ladies?